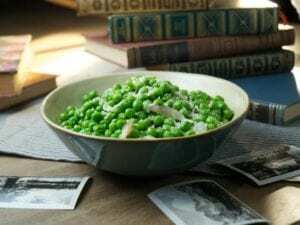 You won't even think about leaving your peas on your plate with this recipe! These peas are easy to make and easy to pair with virtually any dinner. Melt the butter in a medium skillet over medium heat. Add the shallots and a pinch of salt and cook until soft and translucent. Stir in the peas and ½ teaspoon salt and cook until the peas are soft but still bright green. Add the lemon juice and toss. Remove from heat and stir in the Parmesan and a generous pinch of black pepper.